Brighten your home or office with my beautiful and professionally finished canvas art. 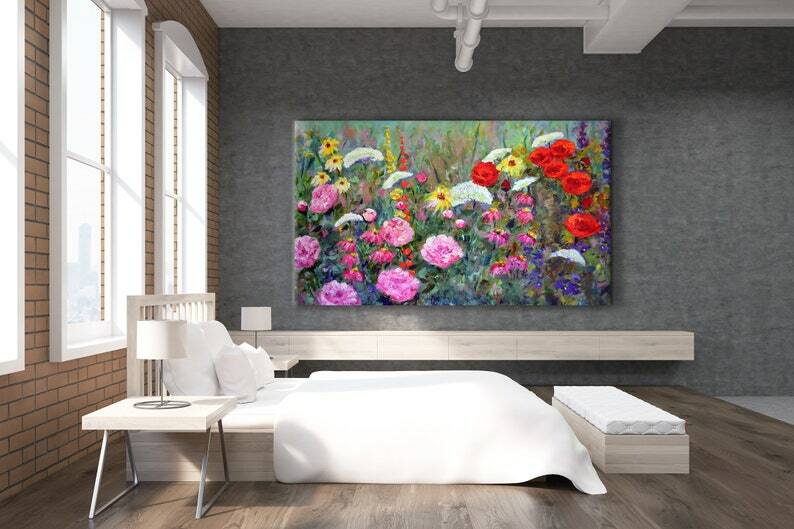 This design is "Old Fashioned Garden" with Pink Peony flowers, red Roses, Delphiniums, Marguerite Daisies, Coneflowers from my original colorful acrylic art painting. CANVAS Giclee Art Print by Claire Bull sizes 12 x 16" up to 24 x 32"
Wood stretcher bars, Epson Archival inks for durable water resistant vibrant clarity, hand stretched and stapled with locally sourced premium wood, pre-attached hanging wire with hardware included. Art © Claire Bull. Please respect the artist's rights and do not reproduce or resell the art. Watermark does not appear on purchase. Thank you.